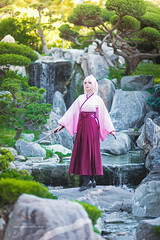 Okita was actually not my first choice to cosplay. I wanted to make a FATE Group with my friends who also wanted to come to Argentina for the convention. Because our moving too so much time (and money) away, I actually had to switch to Okita instead of cosplaying the character I first planed. Still after the costume was ready, I actually started to like it a lot, so I am happy with the outcome. The costume is self made. Material is heavy cotton that I also gradient-dyed myself. Because I ran out of time before the convention, Danu, a very sweet cosplayer from Argentina, made the hairbow and the arm guards for me. 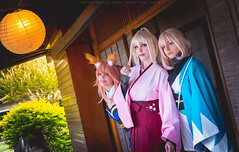 I loved cosplaying together with Danu and Martel as Fate girls.